I picked up some ground turmeric because I need it for several upcoming recipes. All of these recipes will be savoury (risotto and stew, to name a few), but I figured I should try turmeric in something sweet, like my oatmeal! If you’ve never used turmeric before, it’s similar to ginger but with a deeper, slightly bitter and less spicy flavour. Turmeric is usually sold dried and ground but sometimes you can find it fresh. Fresh turmeric looks like a knobby root, similar to fresh ginger but more orange in colour. Asian, Middle Eastern, Indian, and African cuisines all use turmeric for its vibrant colour and distinct flavour. It’s used in curries, imparting that intense golden colour (that we curry-lovers know so well) to the dish. A little turmeric goes a long way. Try a 1/2 teaspoon in your oats along with 1/2 teaspoon of ground cinnamon and a pinch or two of ground ginger. This trio of spices works well for a warming breakfast, perfect for chilly winter days! 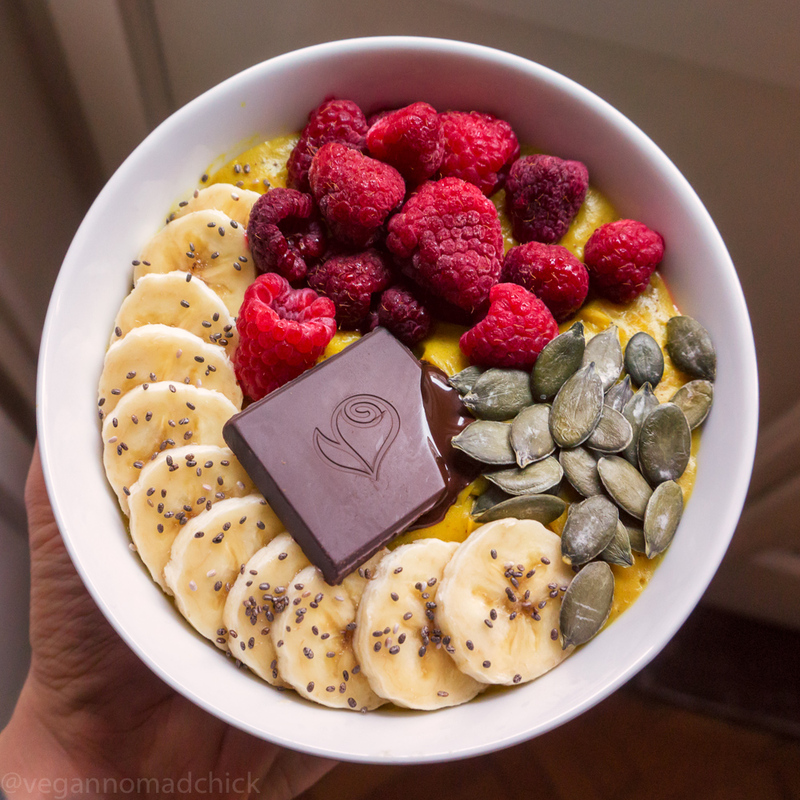 Top your turmeric oatmeal with fresh persimmon, sliced banana, fresh or frozen berries, dried cranberries, pumpkin seeds, and even dark chocolate. 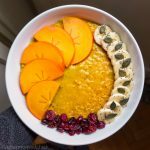 I thought persimmon would be my favourite topping for turmeric oats but after my bowl this morning, dark chocolate wins! Have you used turmeric before? What are your favourite recipes? Creamy, colourful, and a hint of spice. 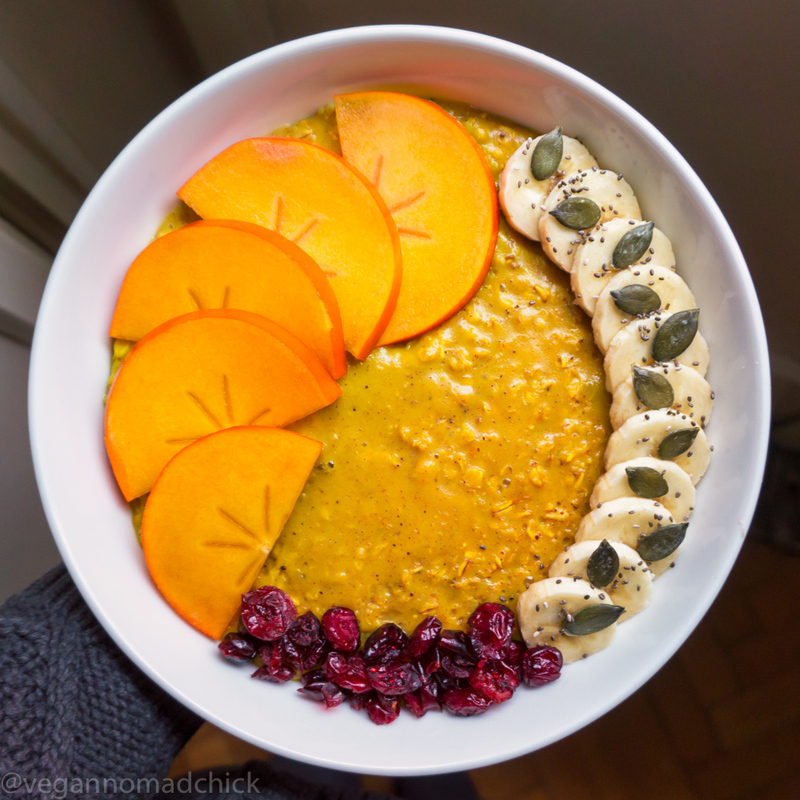 This warming bowl of oats is perfect for winter! I like using soy milk in this recipe because it makes the oatmeal creamier. You can use water instead of soy milk if you don't have any available, or try using another non-dairy milk. 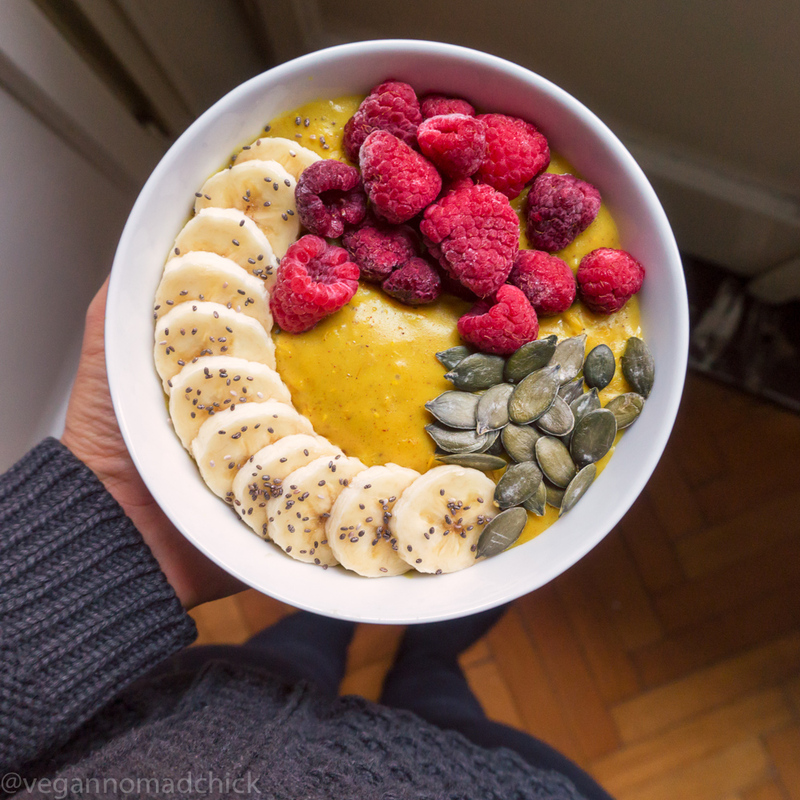 Oatmeal is my go to meal but I have never tried turmeric Oatmeal. 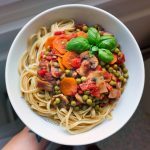 Your blog is lovely, where to you get inspiration for you recipes?